as immortalised by James Herriot’s books. So with that thought firmly in mind here are some more pics as the installation progresses to the first floor. Our Neural Home is a 3 storey building, so one of the tasks in the design stage was working out routes for the cables between floors that did not conflict with other services. I re-used an old pipe box section as the main route between 1st & 2nd floors for all ELV cables. 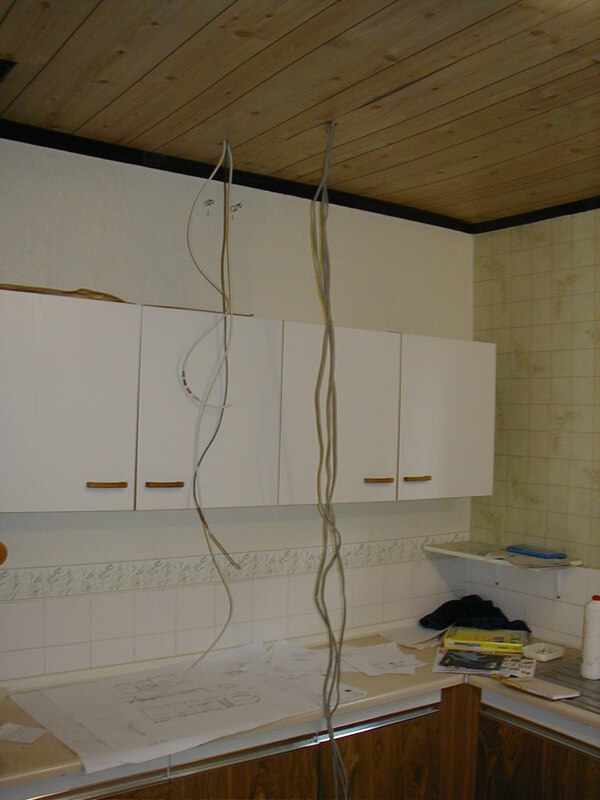 A separate route for mains cables was created within the studwork on the opposite wall. This boxing was ideally situated with good horizontal alignment between Node-0 and Node-I and this route. Prior to completion the cables were cable-tied together to help support them. The cavity as it entered the floor above was stuffed with glass wool for fire and smoke protection. I had not thought about this at first but several tradesmen advised me to do this. Unfortunately this has the consequence of hampering further addition of cables but given the frequency with which this is likely to happen is a precaution worth taking. I will also seal other cavities and routes I created between rooms with fire retardant foam. The corner of the old kitchen that is destined to become Node-0. I dropped these cables through the ceiling early to get an idea of how much spare cable I should leave. Having spoken to a few people I underestimated for these early data cables. I allowed plenty for them to terminate in a high mounted patch panel, but there isn’t sufficient to allow the patch panel to be worked on at work-surface level, so all the punching down will have to happen on a shelf up a ladder – not so convenient. This entry was posted on Friday, October 20th, 2006 at 9:27 pm and is filed under Home automation. You can follow any responses to this entry through the RSS 2.0 feed. You can leave a response, or trackback from your own site.